I will start by saying I have never been a true "camper". Sleeping in tents, not being able to shower or going to buy my morning coffee are all the reasons why. We went on this rafting trip in celebration of a long time friend's 50th birthday. So glad we did. This is an incredible adventure. The Western River guides we had were so knowledgeable about river running and the history behind it. The white water rapids we went through were exciting (although this river is very cold). It's only cold for a few minutes... Water dries! 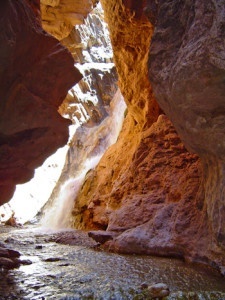 We stopped a few times a day, sometimes to see something interesting like the Travertine Grotto, or the Pumpkin Springs. The guides would give a little info talk and let us explore a bit. The time on the water was very relaxing. They would tell us jokes, read some interesting articles and just generally share what they know. When we arrived at camp in the late afternoon, we set up individual campsites and they went to work setting up the kitchen and toilet area. The food they served was very good. We had Buffalo wings, pasta with both a meat sauce and a vegetarian sauce. They served breakfasts that were better than many restaurants, one morning they made hot blueberry muffin cake and served it warm. The next night they served iced shrimp cocktail, Strip steaks with rice and sautéed green beans. Since there were 3 birthdays on our trip, they made a yellow cake with chocolate frosting! Clearly, we can't say enough about this trip. It had just enough relaxation with some rapids to make it exciting. If you want the adventure of rowing through the rapids yourself, this is not the trip. The J-rig is driven through it with a motor but we thought it was great.